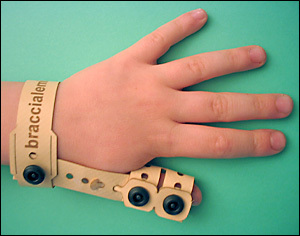 The Milly Bracelet, made of plastic, covers the patient’s finger, adapting to any form of the finger and hand; it is provided with latches with resin rivets. All materials used comply with EC directives. The bracelet was tested by Doctor Aldo De Falco, a specialist in orthopaedics, and it seemed totally safe. The bracelet solves the problem of finger-sucking at children and teenagers (patented device).